Ok, who is the wise guy who invented this? Or better yet, who is the wise guy who is looking to market this for golfers? Can we make a stand, here? Can we put our soft-spiked-feet down and say, "Enough is enough?" 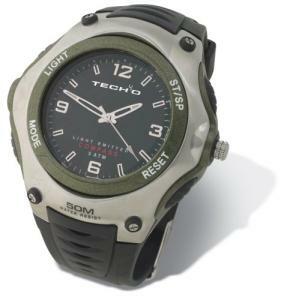 I'm a little offended by the Tech 40 Northstar CW3 Sports and Outdoors watch... and I'm going to tell you why. It's one thing to make a nice watch that works well with sports -- being easy to read and having some standard features like time, date, and day. It's another to make it water resistant -- you know, for when you forget to take it off while swimming. (Or plunge you hand into the pond for your last Titleist ProV1.) Fine. I'm a little hurt, but it still doesn't feel like an attack. But then someone went too far. A compass? An LED display under the analog dial that shows direction in 16 indicators and 1 degree bearing increments? Listen, I'm not that good of a golfer, granted -- but I don't need a compass to find my way back after looking for my ball! Don't play innocent, Tech 40 -- I knew that's what you had in mind when you marketed this watch to golfers. You know what tipped me off? You made the compass display a hidden LED so that I wouldn't be embarrassed when trying to find true north after tromping through poison oak to look for my O.B. shot! The jig is up and I'm on to you, Tech 40.